RETRACTED ARTICLE: Is it possible to control and optimize technology transfer process? Is it possible to control and optimize technology transfer process? Engineers and quality practitioners are often faced with the problem of determining the optimal choice of key factor in the tolerance process evaluation regarding the quality of the process to be monitored. To guarantee a prefixed quality level of the monitored process, lower specification limit (LSL) and upper specification limit (USL) for a certain quality characteristic have been determined. These limits, LSL and USL, could be defined as μ − δσ and μ + δσ, respectively, where δ > 0. Here, the key factor δ represents the number of standard deviations at which each specification limit is located from the process mean. This paper shows an innovative use of SPC tools in a different field aspect, one in which they are usually employed. Generally, these instruments are used for the control of the industrial process or service, but they could be used in an innovative way to control and to optimize a particular process: the technology transfer process. When determining the key factor level, it is important to consider a trade-off between costs incurred by the supplier, in terms of technology offer, and the user, in terms of technology request, of the process examined. This paper shows how these costs are quantified and integrated; it also shows how a particular mathematical tool, the Lambert W function, is incorporated into this choice optimization problem by deriving a closed-form solution. This proposed model and solution may be appealing to managers and technology transfer operators since the Lambert function is found in a number of standard optimization software. Experimental results are presented and related to a real data set of technology transfer actions developed by the Technology Transfer Office. The study on technology transfer covers various disciplines and topics such as the process, the barriers, the opportunities, and the modes of technology transfer (Reisman ). Functional performance and economic considerations should be considered in this analysis as driving factors affecting the choice of key factor in the quality analysis of a technology transfer (TT) process. A tight standard deviation in a generic process usually implies high cost (for example, high manufacturing cost) due to additional (manufacturing) operations, slow processing rates, additional care on the part of the operator, and a need for expensive measuring and processing equipment. The functional performance, however, can be improved by specifying a tight standard deviation on a quality characteristic. On the other hand, a wide standard deviation reduces the (manufacturing) cost but may considerably lower the material quality level. Thus, determining optimal standard deviation involves a trade-off between the level of quality based on functional performance and the costs associated with the standard deviation. In this particular context, the manufacturing cost could be assimilated to knowledge production. In order to facilitate the economic trade-off, it is possible to express quality in monetary terms using a quality loss function. 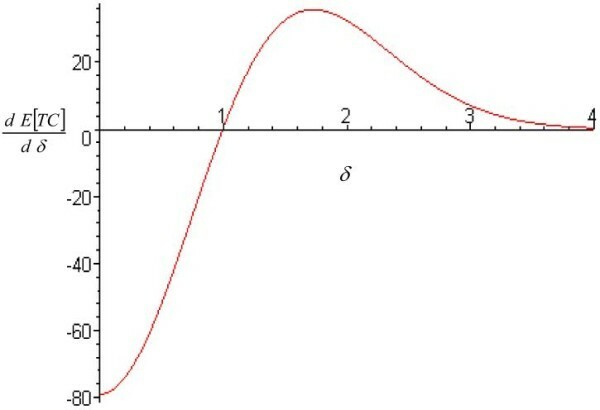 The quadratic loss function is widely used in the literature as a reasonable approximation of the actual loss to the customer due to the deviation of product performance from its target value. By expressing the level of quality in monetary terms, the problem of trading off quality with costs is converted into a problem of minimizing the total cost, which is the sum of quality loss and costs. The costs associated with the standard deviation include rejection, inspection, and manufacturing costs. The problem of determining an optimal level of tolerance is equivalent to the problem of determining optimal specification limits since the term refers to the distance between its lower specification limit (LSL) and upper specification limit (USL). Behind the different object of the application's methodologies regarding the technology transfer process, the proposed analysis in this paper also differs from previous studies of optimization of choice of the key factor in two ways. First, a more general optimization model is proposed by simultaneously considering the quality loss incurred by the user, and manufacturing and rejection costs incurred by the manufacturer in a building process, than a numerical example, relate to a specific process (TT process) that will be developed. 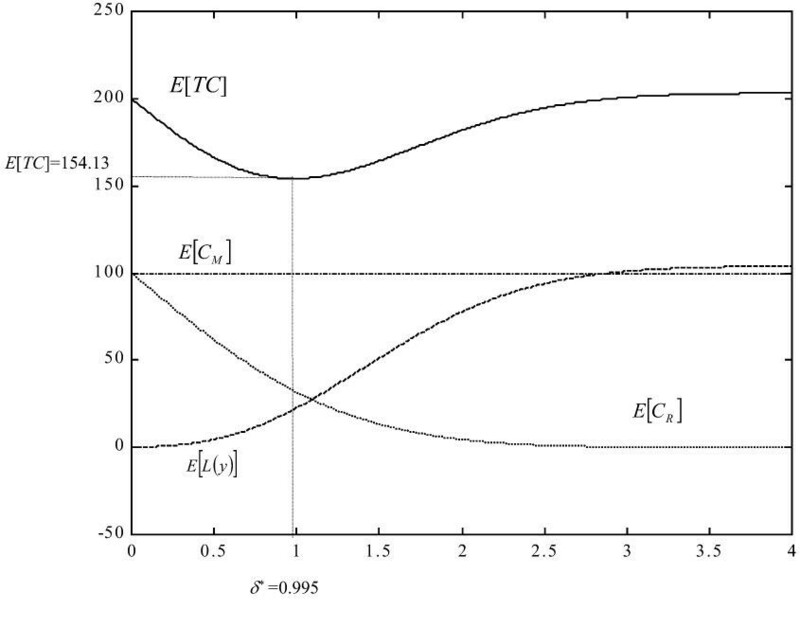 Second, this paper shows how the Lambert W function, widely used in physics, can be efficiently applied to the optimization problem, which may be the first attempt in the literature related to optimization and synthesis. There are two significant benefits from using the Lambert W function in the context of choice of key factor optimization. Most optimization models require rigorous optimization processes using numerical methods since closed-form solutions are rarely found. Using the Lambert W function, TT practitioners and research and development (R&D) managers cannot only express their solutions in a closed form, but they can also quickly determine their optimal choice without resorting to numerical methods since a number of popular mathematical softwares, including Maple® and Matlab®, contain the Lambert W function as an optimization component. There are not many previous studies about the opportunity to transpose such models, methodologies, and tools from the quality field to the TT field. Robinson () has identified a large number of factors and sub-factors that are relevant to the international technology transfer process. This model does not include any prescription for successful transfer. Keller and Chinta's () integrative model, however, provides some strategic guidelines for this purpose. Although this model focuses on the success of the transfer process, there is no discussion on the post transfer performance of the technology. Sarina et al. () refer to technology transfer performance through the research of relationship between the technology transfer itself and the absorptive capacity. Quazi () illustrates the application of the principles in total quality management to the International Technology Transfer processes used in industrial production plants. While regarding the studies on the use of the Lambert function in the traditional sectors of application, a number of researchers have considered the problem of determining optimal tolerance. Chase et al. () and Kim and Cho () investigated the effect of tolerances on manufacturing cost and proposed models to determine tolerances for the minimization of manufacturing cost. Fathi (), Phillips and Cho (), and Kim and Cho () studied the issue of tolerance design from the viewpoint of functional performance, where functional performance is expressed in monetary terms using the Taguchi quality loss concept (Taguchi ). Tang and Tang () discussed an economic model for selecting the most profitable tolerance in a complete inspection plan for the case where inspection cost is a linear function of the tolerance. Fathi () devised a graphical approach for determining tolerances to minimize the quality loss and rejection costs for a single quality characteristic. Other studies (Tang ; Tang and Tang ) further investigated screening inspection for multiple performance variables in a serial production process. Tang () presented a comprehensive literature review related to the design of screening procedures. Jeang () proposed an optimization model for the simultaneous optimization of manufacturing and rejection costs and quality loss using a process capability index to establish a relationship between the tolerance and standard deviation. The model assumes a zero process bias condition, that is, the mean is equal to the target value for the quality characteristic. Further, the ratio of tolerance to the standard deviation is assumed to be constant. Jeang () demonstrated how response surface methodology can be employed to determine tolerances of components in an assembly. Kapur () considered a tolerance optimization problem using truncated normal, Weibull, and multivariate normal distributions. The Lambert W function is defined to be a multi-valued inverse of the function (z)=ze z , that is, Lambert W(z) can be any function that satisfies Equation 5 for all z. This function allows solving such functional equations as g z e g z = z and z = e W l n z , and ze z =x and z=W(x). One index that could be used as representative of TT process performance is the number of invention disclosures. This index is considered by Hulsebeck as ‘the most important measurable performance indicator of TTO’ (Hulsebeck et al. ). We could assume a threshold number of invention disclosures; the TT process is judged acceptable, and the user loss is zero if the number measured falls within the specification limits. However, it seems more reasonable to assume that a quality loss is incurred by the user even when the index deviates from the target within the specification limits. A quadratic loss function is used to evaluate a quality loss within the specification limits in the proposed model. In addition to the loss incurred by the user, costs incurred by the research body (the supplier in the TT chain), such as rejection cost, related to the number of invention considered not useful by the users and research cost are also included. For the chosen index, we consider the quality characteristic Y that is normally distributed with mean μ and variance σ2. Let f(y) and F(y) denote the probability density function and cumulative distribution function of Y, respectively. LSL and USL are defined as μ–δσ and +μ–δσ, respectively, where δ > 0. Here, δ, the key factor, represents the number of standard deviations at which each specification limit is located from the process mean. One of the most important issues encountered in the area of quality of technology transfer is the selection of a proper quality loss function (QLF) in order to relate a key quality characteristic of the TT process to its quality performance. The QLF is a means to quantify the quality loss on a monetary scale when the TT process deviates from user-identified target value(s) in terms of one or more key characteristics. This quality loss includes long-term losses related for instance to poor reliability of an invention, customer dissatisfaction, and eventual loss of market share. The QLF functional relationship depends on the type of QLF used. Several forms of QLF have been discussed in the literature of statistical decision theory, where utility is viewed as the negative of quality loss. QLFs relate quality performance to three types of characteristics: ‘smaller-the-better’ (S-type), ‘nominal-the-best’ (N-type), and ‘larger-the-better’ (L-type). For N-type characteristics, there is an identified target value. On each side of this pre-specified target, the performance of the material/process deteriorates as the value of the characteristic deviates further from the target value. Designers often set both LSLs and USLs for each N-type characteristic. For S-type characteristics, such as wear, deterioration, and noise level, the desired target value is zero. Here, the TT process designer is likely to set a USL. For L-type characteristics, such as utility of invention and life of the invention, there is usually no predetermined nominal value. Zero quality loss is ideally attained when the characteristic assumes the target value of infinity. where k is a positive coefficient, which can be determined from the information on losses relating to exceeding a given customer's tolerance. E C R = C R ∫ − ∞ LSL f ( y ) d y + ∫ USL + ∞ f ( y ) d y .
E C R = 2 C R ∫ USL + ∞ f ( y ) d y .
where φ(·), Φ(·), and z denote a standard normal density function, a cumulative normal distribution, and a standard normal random variable, respectively. E TC = E L ( y ) + E C R + E C M = = E L ( y ) + P Y ≤ − t + P Y ≥ t C R + E C M .
min E TC = ∫ LSL USL L ( y ) f ( y ) d y + 2 C R ∫ USL + ∞ f ( y ) d y + a 0 + a 1 t .
∫ r + ∞ φ z d z = 1 − Φ r , ∫ r + ∞ z φ z d z = φ r , and ∫ r + ∞ z 2 φ z d z = 1 − Φ r + r φ r .
∫ LSL USL L ( y ) f ( y ) d y = k 1 − 2 Φ − δ μ 2 + σ 2 − 2 τ μ + τ 2 − 2 δ σ 2 φ δ .
E C R = 2 C R P Y ≤ − t + P Y ≥ t = 2 C R ∫ USL + ∞ f ( y ) d y = 2 C R 1 − Φ δ .
E TC = φ δ 2 k μ − τ 2 + σ 2 − 2 C R − 2 k δ φ δ + − k μ − τ 2 + σ 2 + 2 C + R a 0 + 2 a 1 σ δ .
that is, the optimal LSL and USL are obtained as LSL*=μ–δ*σ and USL*=μ–δ*σ. The Lambert W function is available in a number of standard optimization software, such as Maple® and Matlab®. need to be met in order to obtain the minimum value of E[TC] at the stationary points. In many industrial situations, C R is very large compared with (μ–τ) and σ2. Here, the proposed approach of the ‘Proposed model’ section is developed considering the entries cost defined in the ‘Determining optimal choice of key factor’ section with referring to the innovation costs. The problem of the innovation cost is particularly important for managers to avoid unforeseen costs in implementing the technology transfer actions. Experimental data are referred to the database of the TTO of the University Federico II of Naples. In term of relationship between actions that were successful with respect to total actions undertaken, the variable referred to the TT actions is normally distributed with a mean (in percent) of 49.8 and a standard deviation of 1.0. A quality loss incurred due to a deviation from the target value of the quality characteristic is given by the quadratic function of k(y–50)2, where, for example, it has been fixed at 50 as the target value. TT actions with Y less than LSL and greater than USL are rejected, andμ=49.8,σ=1.0,τ=50,C R =100,andk=100. Using regression analysis, the relationship between the research cost and the range was described by the polynomial model C M =100–0.2δσ. Using the closed-form solution given in Equation 23, δ* is 0.995. This optimal value can be verified from the plot of the expected total cost shown in Figure 1, where the minimum value of E[TC] at δ * =0.995 is 154.13. For δ* with the value 0.995, [L(y)], E[CR], E[C M ] , and E[TC] are 22.36, 31.79, 99.98, and 154.13, respectively; and the percentages of E[L(y)], E[C R ], and E[C M ] versus E[TC] are 14%, 21%, and 65%, respectively. Relationship between E[TC] and δ. Although research cost, here evaluated as the cost of research human resources, is commonly ignored in many tolerance optimization models, it may not be a good assumption because it is evident from this particular example that a failure to consider the research cost in tolerance optimization is likely to result in a suboptimal tolerance. Figure 2 shows how E[TC], E[CM], E[C R ], and E[L(y)] vary as δ changes. Plots of [ C R ], E [ L ( y )], and E[C M ] with respect to δ. It can be seen from Figure 3 that the first derivative of the expected total cost becomes zero at the optimal value of δ * =±0.995. However, the negative value is ignored since δ is always greater than zero. 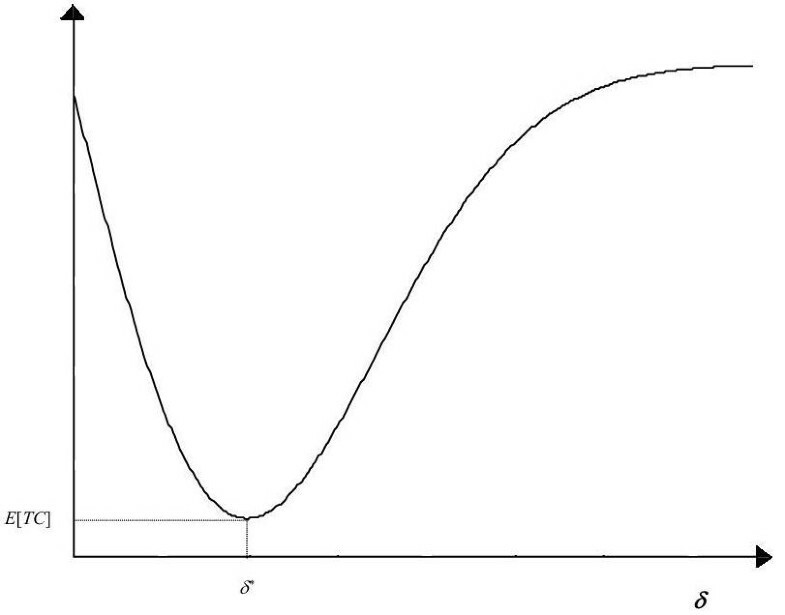 Plot of ∂E[TC]/∂δ with respect to δ. The conditions of convexity of the E[TC] function discussed in the ‘Proposed model’ section (Investigation of the second derivative and the conditions for convexity) are shown in Figure 4, in which a plot of ∂2E[TC]/∂2δ is shown where the second derivative is greater than zero in the interval 0 ≤δ≤1.795. It implies that E[TC] is a convex function, and the local minimum becomes the global minimum in the specified interval. Plot of ∂ 2 E[TC]/∂ 2 δ with respect to δ. The sensitivity of the optimal specification limit to the changes in the mean and standard deviation are shown in Tables 1 and 2, respectively. 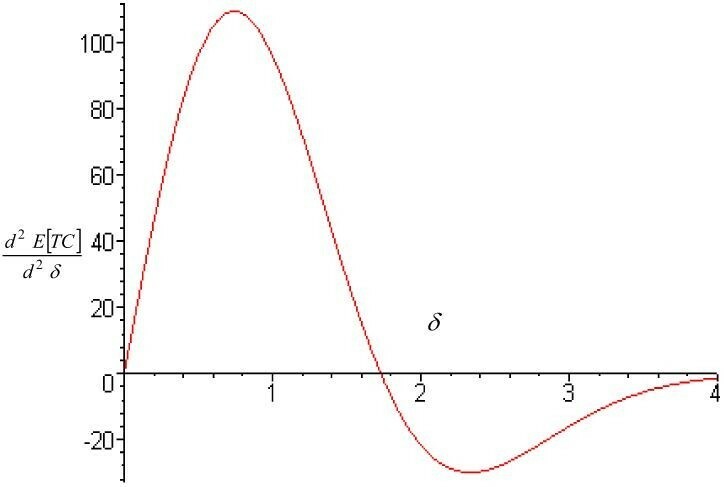 It can be observed that δ* gradually decreases as σ increases. The optimal USL and LSL are 50.8% and 48.8%, respectively. When σ = 2.0, E[L(y)] becomes larger since an increase in the key factor's choice implies a lower outgoing TT process quality. E[C R ] is dependent only on δ*, and therefore, the lowest value of E[C R ] is obtained when δ* = 2.23, and the highest value is obtained when δ* = 1.40. In other words, E[C R ] is higher for lower values of δ* and vice versa. Table 1 shows that E[C M ] depends on δ and σ and is the lowest when σ is between 1.7 and 1.8. The effect of |μ–τ| (i.e., process bias) on δ* is shown in Table 2. Finally, Table 3 shows the effect of [C M ], E[C R ], E[L(y)], and E[TC] to the changes in δ and σ. Results give an idea of the optimal choice for the key factor in the quality analysis for one, the number of invention disclosures, of the set of the quality indexes of TT process. Managers, TT operators, and R&D managers are often faced with the problem of determining the optimal choice of key factor in the tolerance process evaluation regarding the quality of the technology transfer process. This paper showed how the costs related to this choice are quantified and integrated and also showed how the Lambert W function is incorporated into this choice optimization problem by deriving a closed-form solution. This proposed model and solution may be appealing to operators since the Lambert function is found in a number of standard optimization softwares. Results are presented, in this first paper, in terms of the number of invention disclosures as one of the indexes of a TT process. As ∫ e − u / 2 = − e − u / 2 , we get ∫ z φ z d z = 1 2 2 π ∫ e − μ / 2 d u = − 1 2 π e − u / 2 = − φ z .
Lemma 1. Suppose χ ϵ R1and the mapping η : χ →R be η=χeχ, then the solution for χ is given by =LambertW(η). Proposition 1. If η2=(χ+η1)e χ , where η1and η2are not functions of χ, then χ = Lambert W η 2 e η 1 − η 1 . Therefore, the solution for χ can be obtained as = L a m b e r t W η 2 e η 1 − η 1 . SDF has a Ph.D. in Electrical Engineering. He is the chief of the Technology Transfer Office of School of Sciences and Technologies of the University Federico II of Naples, and he is the adviser of TT - Technology Transfer Magazine and he is the AICTT president of the Italian Association for Promotion of Culture of Technology Transfer. The Editor-in-Chief of the Journal of Innovation and Entrepreneurship retracts this article per the Committee on Publication Ethics (COPE) guidelines on plagiarism, due to unattributed use of substantial portions of text from the following article, by Shin, S., et al., ?Integrating the Lambert W Function to a Tolerance Optimization Problem? (Quality and Reliability Engineering International 2005; 21: 795-808; Wiley Inderscience, DOI: 10.1002/qre.687). The Editor-in-Chief takes issues of research and publication misconduct seriously in order to preserve the integrity of the academic record. Our apologies are extended to the readers that this issue was not discovered before publication. An erratum to this article can be found online at http://dx.doi.org/10.1186/s13731-016-0052-x.